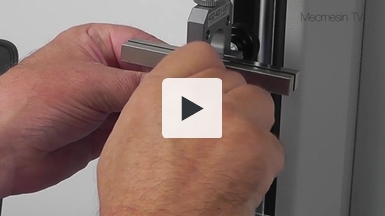 A 90° peel test of pressure sensitive adhesives is carried out using a FPT-H1 horizontal friction peel tear tester and a 90° peel test fixture kit. 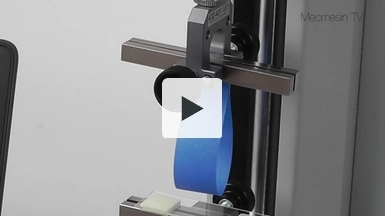 This is suitable for testing to a range of peel testing standards including FINAT 2, ASTM D3330 Method F, Afera 5001, BS EN 1939 Annex B and PSTC 1001 Method F.
This video shows a MultiTest-i force testing stand and Emperor software performing a 180 degree peel test based on ASTM D3330 - the standard test method for peel adhesion for pressure-sensitive tape. 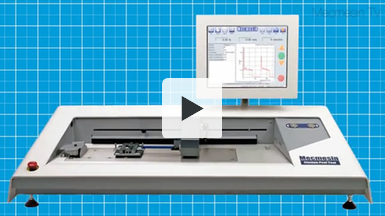 Emperor control software can be programmed to calculate the average peel force over the required sample length, and can report the force per unit width of tape. A 'loop' tack test is carried out to test standard FINAT No. 9. 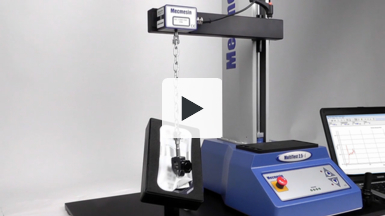 A sample is prepared and the "application tack" is measured using Mecmesin's MultiTest-xt console controlled test system. The test system is driven by Emperor software, that measures the peak force to completely separate the loop from the glass plate. 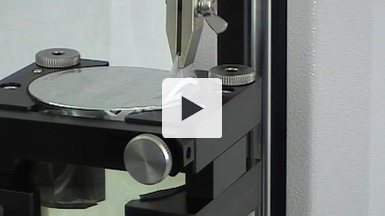 A peel test on a foil sealed wine glass is conducted using a MultiTest 1-i PC-controlled force tester. The peak and average force needed to remove the foil lid from the wine glass is measured and the results are displayed graphically using Mecmesin's Emperor force measurement software. Loop tack tests measure the bond formed by pressure sensitive adhesives when brought briefly into contact with another surface. International standards, ASTM D6195 method A, PSTC-16 method A and FINAT N0. 9 can be performed using Mecmesin’s MultiTest-xt console controlled test stand, driven by Emperor software. A 135 degree peel test is carried out on a sample of medical packaging to ensure maximum seal with minimum peel. 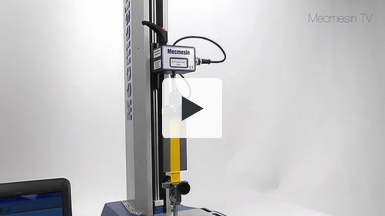 A custom designed vacuum fixture attached to a MultiTest-i PC-controlled force tester holds the sample firmly so that repeatable results are achieved when the lid is peeled off at a constant speed of 500 mm/min. 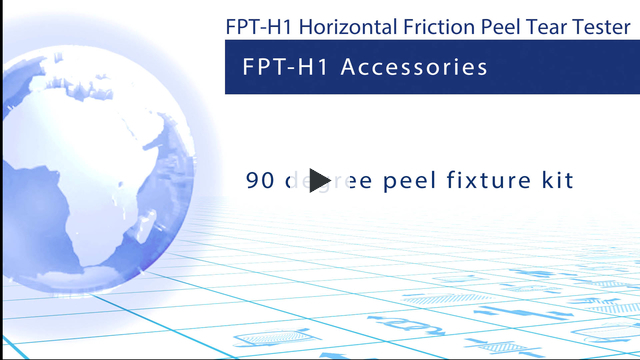 A 180° peel test of pressure sensitive adhesives is carried out using a FPT-H1 horizontal friction peel tear tester and a 180° peel test fixture kit. This is suitable for testing to a range of peel testing standards including FINAT No 1 and 3, ASTM D3330, Afera 5001, BS EN 1939 and PSTC 101. 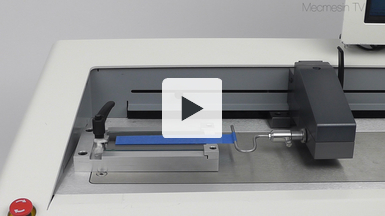 The FPT-H1 is a dedicated coefficient of friction, peel and tear testing machine ideal for testing plastic films, paper, card, board and sheeting materials. The FPT-H1 is pre-loaded with programs to undertake testing to internationally recognised test standards e.g. ASTM D1894, ISO 15359, TAPPI T 549, FINAT, ASTM D3330, ISO 850-2 part 2, ASTM D1938-08, ISO 6383-1 etc.